Today was supposed to be another errand day, but laziness and that pesky but inevitable St. Patrick’s Day hangover took hold in the morning and I ate one of Grace’s magnificent cupcakes (from this recipe here) for breakfast and thought that I could probably spend most of the day in the bathtub reading Kerouac and imagining I had the oomph to find and follow adventure someplace else. And then, I realized that the breeze blowing through my window was warm, and thought that today was a day I could venture outside in a sundress, with a sweater, of course, so I hopped on my bike and crossed the errands off my list like a champ. Apologies for the exceedingly blurry photos of late – I discovered after I uploaded these, after lunch had been snarfed down gluttonously, that the lens was dirty, because I am a slob. It’s so warm and pleasant right now, it’s as if summer is just around the corner. Everywhere I looked, there were rhododendrons and cherry blossoms, and occasionally I caught sight of tulips with petals splayed so wide that spring might as well be half over. It was a glorious seventh day of unemployment, and at this point, I’m not sure I ever want to go back to work. I wish there weren’t so many rules for working – I would be the happiest, most productive worker bee ever if I could follow my own schedule, eat something fresh and homemade at lunchtime, and nap in the sun when I felt like it. There has to be a way to do that. If there is and you’ve figured it out, let me know. 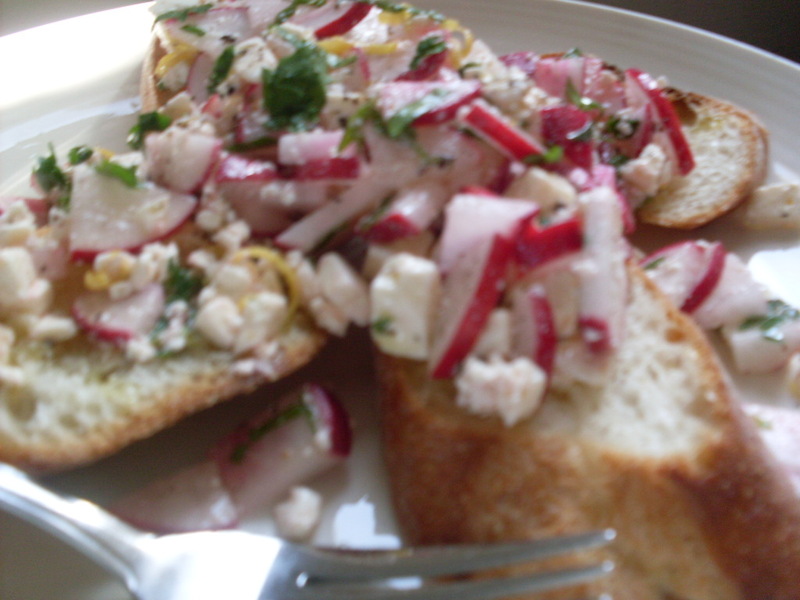 Because it is now spring, and a new season of veggies is upon us, today’s something homemade was radish bruschetta, loosely assembled and flung onto a few crusty slices of rustic baguette. I ate the overflow with a fork, and sipped sweet German Riesling all the while. And I’ll tell you the ingredients, but there’s not really a recipe, because all you do is throw in a bit of this and that, to your taste, and dump it all out onto a few slices of bread. You can make as much or as little as you need, and you can add anything you like. 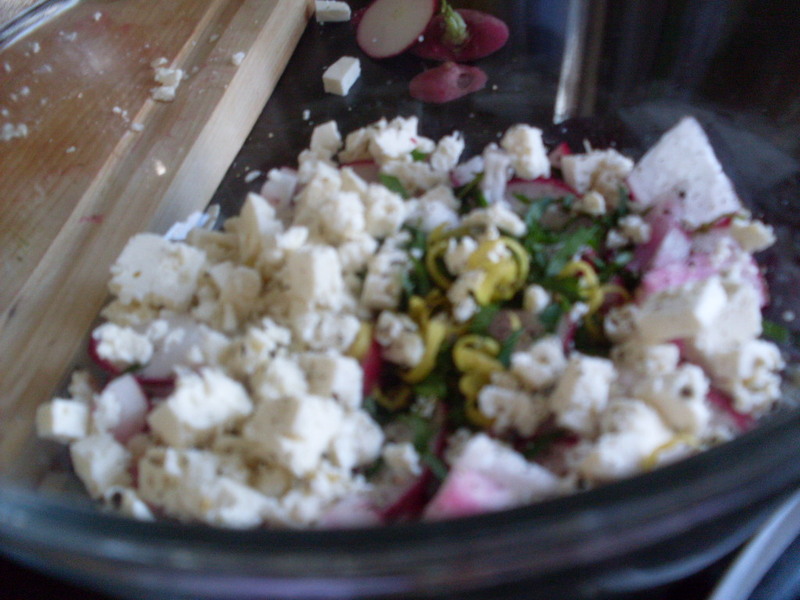 If you cut the radishes bigger it can be more like a salad, and if you chop them a little finer, they could pass for a sandwich filling. 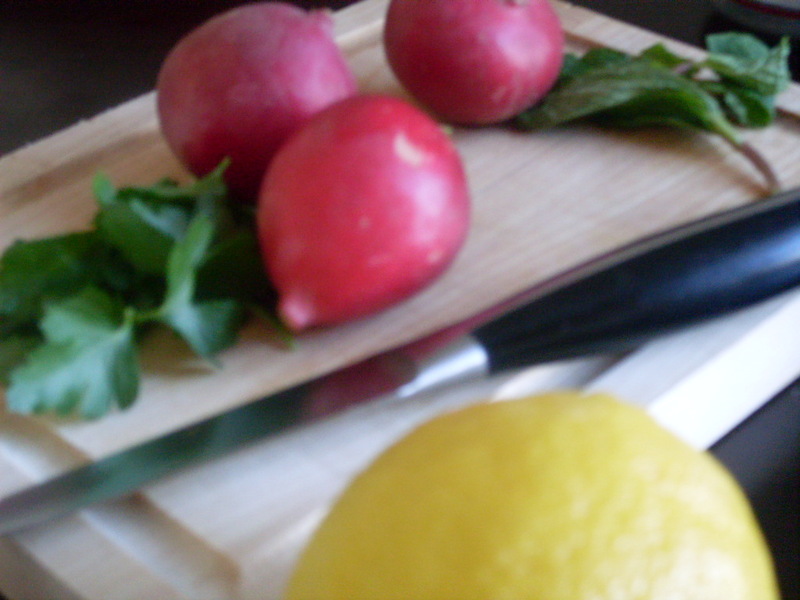 Slice the bread, and into a bowl slice the radishes, crumble the cheese, chop the mint and the parsley, and zest and juice the lemon. Drizzle with olive oil, and grind as much pepper as you like into the mix. Toss. Then spoon out onto bread. This is nourishing springtime lunching at its best. I think it’s time for a nap now, then a wander to the wine shop, and then to build a fort in my living room. < Previous Not your regular old ham-leftovers soup. Next > Bread pudding with spinach, feta, and ham.